I don’t know about you, but I never get tired of seeing (observing) our national symbol, the bald eagle!� I saw one again yesterday, and it made my day.� Fifteen years ago it was an extremely rare sight to see an eagle in Monroe county.� Today it is almost commonplace! � I’m not for certain, but I believe we now have approximately 16 nesting pairs residing in the area.� Chalk one up for conservation.� Eagles have made such a comeback nationally that they have been removed from the endangered species list.� If we , as a nation, continue to be diligent with our resources, and reverse the effects of past sins (i.e. pollution), our children will reap the benefits.� Clean air, clear water, and pristine wilderness should be the goal of all who cherish this great land we have been entrusted with. 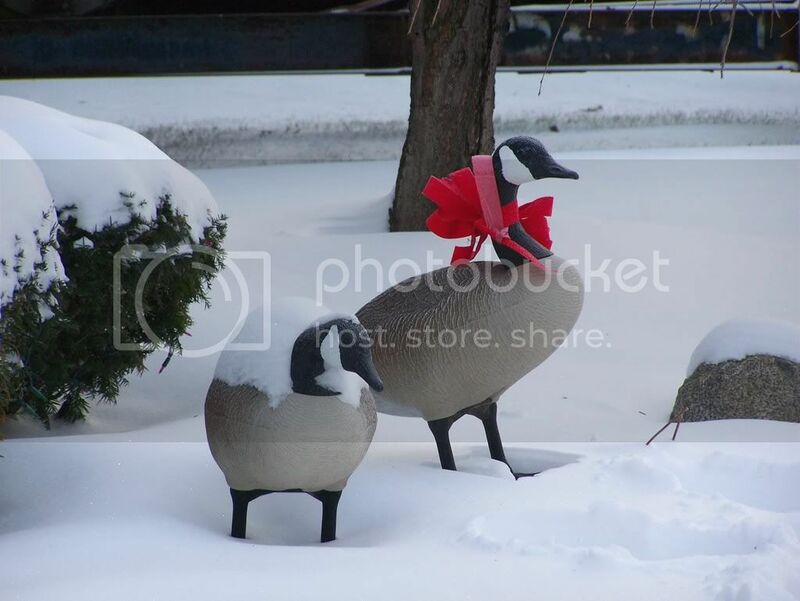 The Hebrew profit Isaiah said “They that wait upon the Lord shall renew their strength, they shall mount up with wings of eagles.� They shall run and not be weary, they shall walk and not faint.”� Have a wonderful and exciting new year. This is a picture of the three oldest Ansel “boys”Randy, Mike, and Darryl. In the winter, when deer hunting season is over, and you want to keep your shooting skills finely tuned-an indoor archery league is just the ticket. 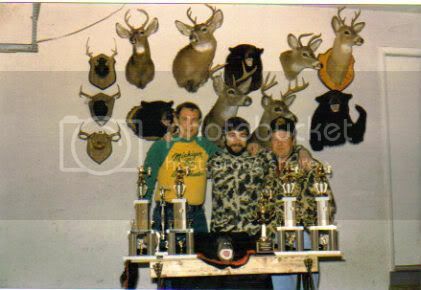 Many moons ago the three of us teamed up to win the Lincoln Bowman bowhunter league in Trenton. I was on the winning team three of the four years I shot in this league. I also participated in the Canvasback Gun Club winter outdoor league teaming up with my pal Bob Baltrip to win it a couple years. Tomahawk Archers, and Monroe Rod and Gun Club, along with Dundee Sportsmen Club also host various winter archery meets in the Monroe area. There’s nothing like practicing your shooting skills under hunting conditions, foul weather and all! Everyone of my six kids would shoot these winter outdoor events with me, and we would have a blast. Some of my kids became very proficient with stick and string, and the time spent with them is priceless. So to avoid the winter “blahs” find yourself a gun or archery club, and get involved in their winter leagues. It’s great fun for the whole family, and keeps your shooting skills “honed to the bone!” Try it; I guarantee you’ll like it. I had to go way back in my archives to find this picture. 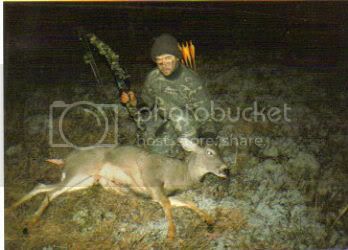 It’s my first deer with a bow taken in Lewiston many years ago. The reason I’m posting this picture is because the season is winding down, and I can’t seem to be in the right place at the right time. I was out again last evening, and didn’t see a thing! Before going to my blind I walked the perimeter of my property, and did not come across one set of fresh tracks. My friend Mike Heil was stationed about 5-miles away at my second spot, and he didn’t see anything either. He said he only saw a few tracks on the 160 acres he was hunting. Now I know there are a few deer left out there, as I did a little exploring on my way over to Hillsdale. On one of the back roads, in Lenawee county, a nice 6-pointer jumped the road in front of my truck. A doe was on his heals. About a mile down the road I saw 11 deer running across a cut corn field. Two of them were huge, but I couldn’t find my binoculars to check for head gear! Could it be that the snow from last week has them yarding-up already? I didn’t think that southern Michigan deer were as prone to congregate, as their northern cousins do. That would explain the lack of deer sign in both the areas I hunt, but I’m not convinced that’s the problem either. Deer sightings were way down this year (at least where I hunt) and quite frankly I think the D.N.R. has really inflated the number of deer statewide. Anyway I probably will only make it out one more time before I have to call it a season. I really want to put a deer in the freezer so we can enjoy some venison for those long winter months. I did get a doe during gun season, but I had that whole deer made into “jerky!” I figured it would be no problem filling another tag, but obviously that plan isn’t coming together so far. There’s still hope – keep ya posted. Awhile back I wrote about the Shinkle brothers (Brad and Ted.) They are approaching 90 years old, but that didn’t stop them from trying to put a tag on a U.P. monster! They have alot they could teach us younger woodsmen thats for sure. Eighty seven year old Ted called me Christmas day to thank me for the article I wrote, for the Monroe Evening News, about him and his slightly older brother. Of course we talked about the deer season and how the “brothers” had done this year. Ted said he had been seeing a real nice 8-pointer during bow season, but couldn’t get him close enough for a shot. He figured come opening day of gun that 8-pointer was his! Wouldn’t you know it, but Ted never saw that buck again. What he did see was several 6-pointers that he could of taken easily, but he opted to wait for the “big-boy!” Ted came home empty handed, but he didn’t have to-he chose to! Good for you Ted! Next year you should have 3 or 4 nice 8-pointers to try and outsmart. Not only did Ted pass on several bucks, but Brad passed on a 6-pointer as well. Brad is 89 years old, and figured he would let this buck get a little bigger for next year! Now thats positive thinking. 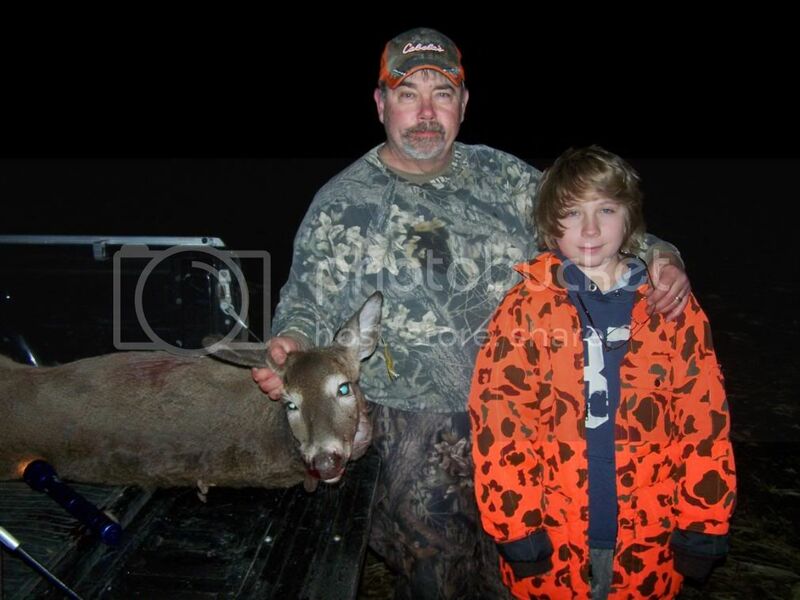 Ted’s son Gary did get a nice buck, so the buck pole was represented by one of the Shinkles again. Like Ted says “If you want to shoot big deer you have to let em go, and let em grow!” These guys are priceless. I don’t plan on getting into a “soap box” issue here, but as a Christian I sense the beating of the drums. What I mean is this! While out in the public arena, I have heard more “Happy Holidays” and “Seasons Greetings” than “Merry Christmases. I even asked one clerk if it was against company policy to say “Merry Christmas?” She replied that she tried saying “Merry Christmas” twice, and was greeted in return with dirty looks! Even the newspaper adds are eliminating the traditional greeting of “Merry Christmas” in favor of the more politically correct version. In the past “Christmas cards” were about Christmas, the Nativity, Peace on earth, Angels and Wise men. Now people send cards with quotes from Confusions or the Dali Lama. Now I know Christmas holds traditions that quite frankly have nothing to do with the “real Jesus,” but it is what it is – “Jesus is the reason for the season!” Just because we have commercialized it to the point of losing the “heart of reflection” toward the incarnation, doesn’t mean we should bow to the “holy grail” of political correctness. I for one am eternally grateful for the significance of Christmas, and the hope and promise that it hold for all true believers. My family and I will forever worship the Christ of Christmas in our hearts, and daily lives, as I believe it was intended. About a week ago I touched on the issue of donating venison to area food banks to feed the hungry. Kristine Shreve (Gun Safety innovations LLC) reminded me about Michigan Sportsmen Against Hunger. Ted Nugent started this organization, which acts as a facilitator for all the groups involved, in Michigan. Founding member groups are Safari Club International, Michigan Bowhunters Association, Michigan United Conservation Clubs, Ted Nugent United Sportsmen Of America, Michigan Dept. of Natural Resources, United Methodist Mens Club, and the Food Bank Council of Michigan. Michigan Sportsmen Against Hunger, or MSAH, is a non-profit organization, and can be reached by calling 313-278-FOOD. Currently there are 59 meat processing places, that work hand in hand with the Dept. of Natural Resources, in processing and distributing donated wild game. The closest drop off processor in my area is Don’s Meat Packers Outlet Inc. located at 14821 East 7-Mile Rd. For other locations go to the Michigan Sportsmen Against Hunger website. Your wild game donations not only help the hungry, but promote good will throughout the communities that benefit from hunters donations. So if the freezers full, or your wife and kids are tired of venison, give the food bank a call. You’ll be glad you did. Not only that your gift is tax deductible-what a deal! This will probably be the last morning I see the sun come up like this during muzzleloader season.� Went out this morning with my brother Darryl, and we only saw one little doe.� He did his best to try and “kick” me something out of the dense underbrush, but it just didn’t happen.� Not that there isn’t any deer sign!� There were plenty of fresh tracks, but you can’t eat em!� The wind was blowing out of the north-east, and that did not help our cause, but it was a gorgeous morning. We stayed on stand till 10:00 o’clock, and then made a few drives.� In our “stomping” around the woods and marshes, we did see plenty signs of foxes and coyotes.� In fact we found a place where a coyote had taken a cardinal.� Now you have to be pretty stealthy to sneak up on a bird!� The wheels are turning for some “varmint” hunting once deer season is over. The weatherman is calling for a warm Saturday with showers, and Sunday is out of the question, so looks like another muzzleloader season is in the books.� It is so nice to have an extended bow season-there is still hope. This has sure been a different hunting season than the one I had anticipated. Plans to get in a few days of muzzle loader season got cut up by a chain saw, and the two days this week I was going to bow hunt, had to be canceled due to a funeral, and a sick grandchild! The muzzle loader hunt got messed up when the neighbor, on the adjourning property decided to select cut his woods. The deer vacated that area due to all the commotion, so that put the old whammy on those plans! There isn’t much you can do when your needed at a funeral service, and grandkids “trump” all bets! So here I am with this lovely snow on the ground, and I can’t seem to get a break till after Christmas. The forecast is calling for rain, and a high of 47 degrees for Saturday. That should take care of the lovely snow! I shouldn’t get too nervous, as it only takes one deer, and one well placed shot to put some venison in the freezer. I just hope I don’t have to rely on the last two days of the season-talk about pressure. Of course we all need to keep things in perspective. After the funeral service today; I walked out to see around 100 people, standing in line for a meal. There were men, women, little kids, and babies standing out in the damp cold waiting for a hot meal. Boy if that doesn’t snap you back to reality. As I pulled around the block, you could see other people (and kids) walking toward St. Joseph’s church hall. For many, in this great country, times are not flowing with “milk and honey!” Our church helps with one of the local “soup kitchens,” and this year they are serving between 75-150- people 7 days a week. If the opportunity presents itself donate some time, food, or money to the various outreaches that are in your community, and thank God it isn’t “you” needing the help! Slow down-look around, and get involved. Has anyone seen a picture of these two Michigan “hogs?” Sorry that the picture didn’t turn out very well, but you get the idea of the size of these monsters. 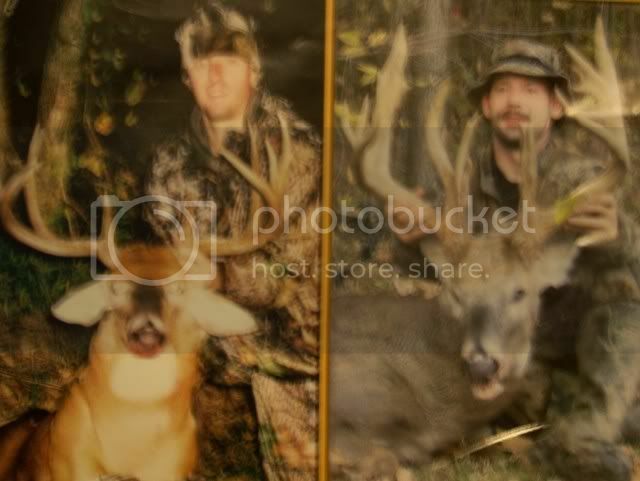 The one on the left is a 9-point and the one on the right is a 19-point, and both were taken with bow and arrows! Bob Reits harvested the “world class” buck dubbed “twin towers” which scored an incredible 209 Boone and Crockett points. He had been hunting this particular deer for several years, and his savvy, persistence, and a little luck paid off big time! The buck was aged at 7-1/2 years, and had a dressed weight of 207 pounds. You know this was one big deer, as he had probably lost a few pounds during the pre-rut, when Bob nailed him. Michigans reputation for producing big bucks will continue to grow if bucks, like this, continue to show up during hunting season. Scott Norkey took the wide spread 9-pointer (21 inches) which dressed out at 193 pounds. If you can believe it Scott shot a monster record class 17-pointer just last year in the same area of Lenawee county. Who says lightning can’t strike twice. Scott has not had this deer scored yet, but a good guess would be the upper 160’s I think. I don’t want to give away alot of the details on these two deer, as the Dec. issue of “Woods and Water News,” has a great story on both of these fortunate hunters. Art over at Simply Outdoors has “tagged” me, as part of Kristine Shreve (Outdoor Innovations) “rules” for finding out more personal information on fellow bloggers. I would of liked to have found a picture with the whole family, but I probably couldn’t of “squeezed” them all onto this blog anyway! 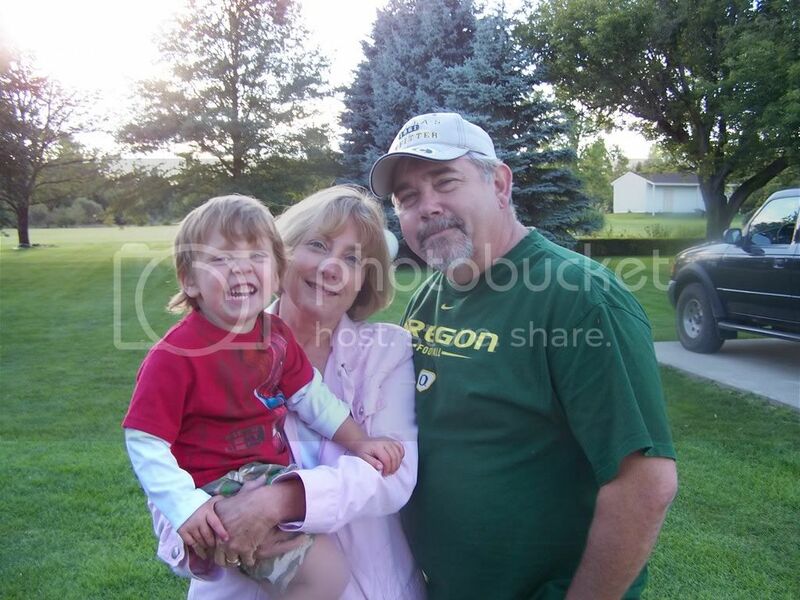 This picture is of my lovely wife of 37 years Lorna, and my grandson Jacob. I call him Jay-Bird! FAMILY: Lorna and I have 5-girls and one boy. I came from a family of 6-boys, and I guess God wanted to teach me something about women. You’d think I’d be an expert by now, but sometimes I still don’t know anything! We have ten grandchildren, and as you may have guessed family is very important to us. As much as I love to hunt, family comes first. My son is the youngest (24) and all my kids are in the general area, except daughter Meghan (Chicago.) When we are all together there are 23 of us to enjoy! HUNTING & OUTDOORS: I am a lifelong hunter, who tagged along with his dad, starting around 6-years old. I have taken 4-deer, 2-caribou, and 1-bear large enough for the Pope and Young record book, but consider myself more of a meat & potatoes hunter than a trophy hunter. I love venison to much to let a whole lot of deer pass under me before I draw down on one. The older I get the less opportunity I have to pursue the sport I love so much. Of course that may have something to do with age, as well as finances, and family responsibilities. My dream has always been an Alaskan adventure, but I’m afraid Father Time is rapidly closing the door on that scenario! You can read more on my blog biography by clicking on ABOUT. MUSIC: I am musically reclined, not inclined, but I like classical and contemporary Christian music. SPORTS: Besides hunting, camping, and fishing, I played a whole lot of slow-pitch softball. I played and managed for over 27 years, taking 2-state titles, and coming in 4th. in the nationals one year. I retired from playing and managing my church team when I was 56 years old, and took up golf. I have a 12 handicap on the links, and I love to hit that little white ball! “FORE” When I was younger I used to drag race at Milan Drag way, and won my class at the Spring Nationals in 1966, with my comet cyclone. Most of my sports now revolve around watching grandkids compete for their schools. TECHNOLOGY: I am such a dud when it comes to technology, and really envy guys like Art. His “Simply Outdoors” home page is one of the best out there. I wish I could spruce up this blog, but the ability just isn’t there-yet! FINALLY: I retired from Ford Motor company as a pipefitter in 2001. I asked Jesus Christ into my heart 32 years ago, and have been involved with my fellowship on a regular basis. I am a charter member of Christian Bowhunters of America, and also belong to Michigan Bowhunters. I write feature articles for the outdoor page of the Monroe Evening News about 6-8 times a year. I enjoy poetry, and have written several hundred poems. I also have written the lyrics for several songs, and one of those songs is on a praise and worship cd that just went on sale at our church. At this point I guess I’m supposed to “tag” some fellow bloggers, so Manic, Phillip (Hog Blog,) and Arts buddy Jeff step to the plate. Hope you all have a Blessed Christmas and a Joyous and Prosperous new year.